Students pursuing the online Doctor of Nursing Practice Nurse-Midwifery (DNP Midwife) track are prepared to provide holistic and women-centered care throughout the lifespan using the midwifery model of care. Our program is committed to the education of nurse-midwives in a unique Christian environment who are prepared to practice in concert with standards of nurse-midwifery practice. In addition, our program is committed to enrolling diverse and qualified students that pursue cultural competency and focus their service and clinical experiences caring for vulnerable populations. Talk to a dedicated enrollment advisor about our online nursing programs. Simply choose a time when you are available to chat, and one of our advisors will give you a call. For full details, please download our program guide. Emphasizing women-focused healthcare services, the curriculum provides a detailed study of birthing, gynecological and preventive care. To see a full list of program outcomes, click here. For featured courses and their descriptions, please download the program guide. Baylor University online DNP Nurse-Midwifery students are diverse and qualified individuals who pursue cultural competency and focus on serving vulnerable populations. Graduates are able to enhance their career as autonomous caregivers and patient advocates who are eligible to sit for the Nurse Midwife certification examination. The program prepares nurse midwives in a uniquely Christian learning environment. Through the integration of faith and learning, Baylor DNP Nurse-Midwifery graduates possess the clinical acumen and exemplary leadership and interpersonal skills necessary to transform women’s care. Graduates who become a Certified Nurse Midwife can earn a salary of $92,000 (annual national average, Payscale.com). Students have the option to complete a DNP project abroad and participate in international research and missions with graduate faculty. To learn more about this track, please download the program guide. We think you will find our school unlike any other in that we truly do consider ourselves as called to prepare nurses through the integration of faith and excellent academics. Watch the video to hear more from the Dean, Associate Dean, students and graduates about Baylor's Louise Herrington School of Nursing, the programs offered, and how the LHSON integrates faith-based learning and excellent academics. Be Bold. Be Decisive. Be Exceptional. Become a Baylor Nurse. 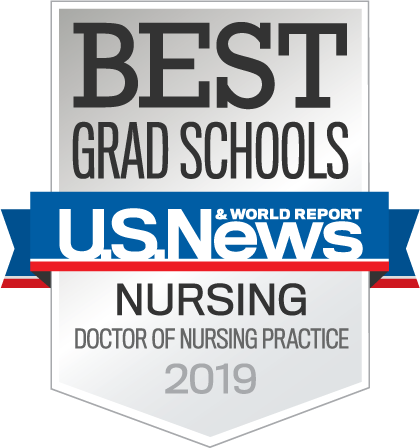 Featured in U.S. News & World Report for the 2019 Best Graduate Schools, ranking our DNP in the top 10% and MSN No. 72. We rigorously adhere to the accreditation standards established by the Commission on Collegiate Nursing Education (CCNE)**. We follow the excellence standards established by the Accreditation Commission for Midwifery Education (ACME)*.